A picture is worth a thousand words. Here are a couple of thousand words. 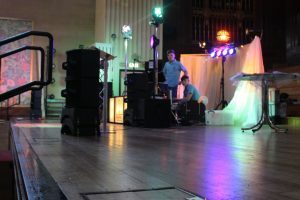 We have gigged at the biggest, most prestigious venue in Swansea, i.e., Brangwyn Hall, Swansea – a prom disco. 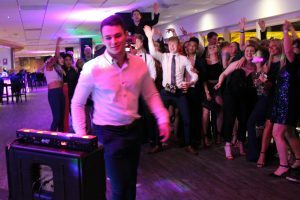 We have done mostly wedding discos around South Wales including West Usk Lighthouse, Newport, Gwent at The Giltar Hotel, Tenby and nearer to home at The Smith’s Arms in Neath Abbey. 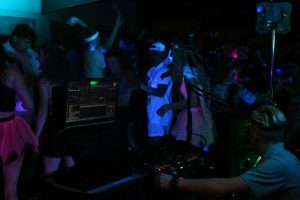 We had been DJ’s in the Swansea area which were, in Langland Golf Club, and at Morriston RFC. 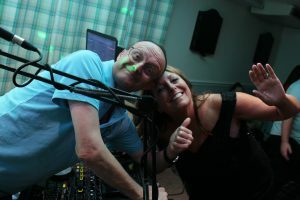 DJ Diamond Dust has travelled to Haverfordwest to do a 40th Birthday Party at The Railway Inn. 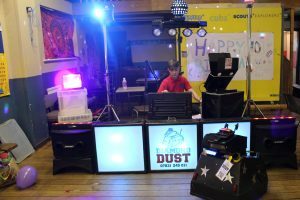 We are still doing children’s discos – an under 6’s Football presentation night complete with games and Mascot the Robot Dog. Quite a bit of travelling and variety of bookings! We definitely have seen many parts of Wales this month! 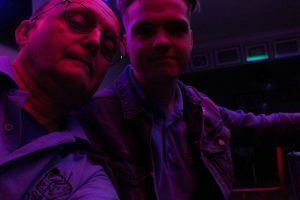 Ethan and I have been up as far as Aberystwyth to do an 18th Birthday Party at The White Swan Inn, Llannon, near Aberystwyth. We went as far east as Cardiff to the Vale of Glamorgan to do a 40th Birthday Party at The Llanerch Vineyard, Vale of Glamorgan. We have gone as far west at Tenby to do our regular Summer Season appearance at New Minerton, Tenby and done a children birthday party for two 6 year olds at Llandovery RFC. 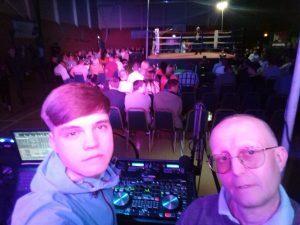 We have even been a few miles away from home to provide sound, radio microphones and lights at a Boxing Event at Cwrt Herbert Leisure Centre, Neath. Don’t forget to see the YouTube video! We are making preparations for the summer and have quite of few interesting ones ahead! It’s been a month primarily of children’s birthday parties. We’ve been around Bridgend with a twin’s 5th birthday party in Ogmore Vale Life Centre and a 3rd birthday party at Glyn Neath Golf Club. Look at our review at our Children’s Party Facebook page! 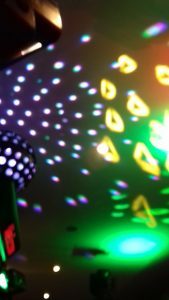 There have been a few Easter discos in our regular venue, Longford Memorial Hall and one at The Mount Pleasant Inn, Abertillery. The has been a mixture of Wedding Parties such as The Bryn Owain, Cowbridge, Glyn Neath RFC and the beautiful Sylen Lakes, near Llanelli. 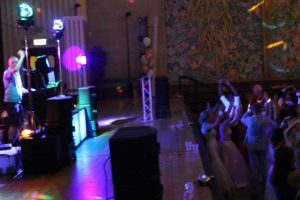 Our Party DJ events have included a 30th at Loughor RFC and a joint 80th and fund raising event at The Earl Haig Memorial Hall, Cardiff. There has even been a 50th Celebration party Doherty’s Wine Bar Glyn Neath. 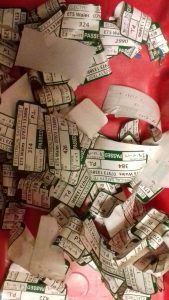 We’ve done our annual PAT testing on our sound and lighting equipment. Looking forward to the summer gigs. Thank you to all our customers for a lovely Spring Season! All the points of the compass! It has been a month of weddings and teenage discos. 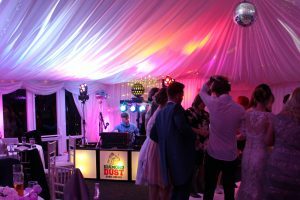 The discos have included a wedding party at the Glyngynwydd Cottages and Wedding Barn, Llanidloes, and a wedding disco at Broadway House, Laugharne. On the way to these venues we got to see some sightseeing and saw Laugharne Castle, Dylan Thomas’s Boathouse and passed Royal Welsh Showground, Llanelwedd, Builth Wells, over the bridge crossing the River Wye and past the Royal Welsh show grounds. 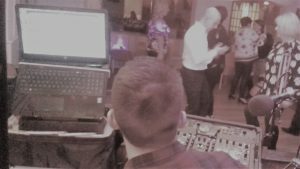 Wedding DJ Ethan Gray at LlanidloesWe’ve gigged at all points of the compass despite a few cancellations and postponed bookings due to the snow. 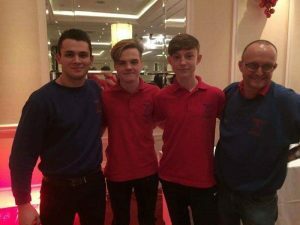 The teenage parties have been one at teenage disco at Cardiff Harlequins RFC, and a 19th birthday party in the Dragon Hotel in Swansea city centre. 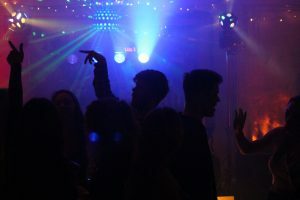 There have been a few birthday parties including 60th Birthday Party at Samlet Social Club, Swansea, and 40th birthday party at Embassy Social Club, Swansea. 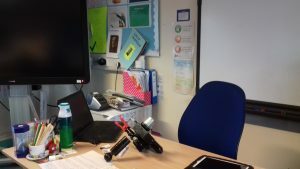 Our birthday party DJs have even been working at a Children 6-year-old birthday party at the Gathering Place, St Athan. Spring is on its way and with a bit of luck we might have seen the last of the snow. Perhaps we can wish for more sun, now that the clocks have moved forward and the days are getting longer! 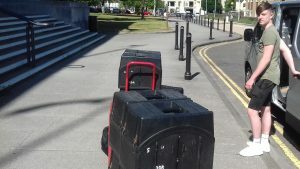 As the weather improves we hope to travel more and enjoy meeting more people, venues and events! 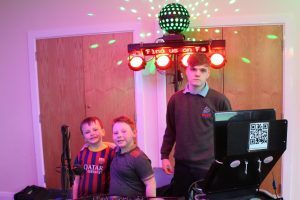 This month we have been DJs at a Teenage Disco at Cardiff Harlequins RFC, an Annual Ball at Halfway Inn, Nantgaredig, Carmarthen, children’s birthday party at Milford Haven RFC and our regular children’s disco at Longford Memorial Hall, Skewen, Neath. It has been quite a mixed bag of gigs. 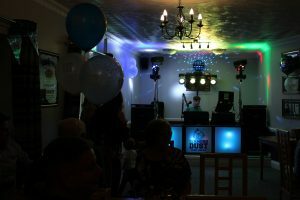 We were DJs in The Discovery Pub in Cardiff and Castlemead Hotel in Tenby. Tom and I have done a wedding disco at Beggar’s Reach, Milford Haven. We’ve done children’s parties in Llandaff North Community Centre, Cardiff and New Minerton Holiday Park, Tenby. 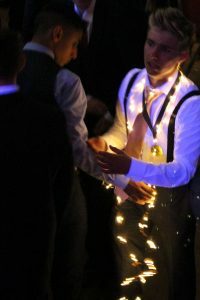 We’ve worked at annual dinner in Chepstow Racecourse, and a few Christmas parties at the Liberty Stadium in Swansea. Well 2017 certainly didn’t disappoint with there being plenty of diverse gigs. 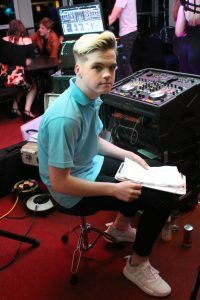 After leaving my full time duties in August last year, I was sad to no longer meet different people and play different music nearly every weekend but that did not mean that I was no longer part of the Diamond Dust Crew. Throughout 2017 I continued to work alongside Martin at Wedding functions, birthday parties and (my favourite) works do’s, and the best part of it all was the fact I never got bored during any of the gigs last year. If I was to pick my favourite gig of 2017, without doubt it would be the Joe’s Ice Cream works do at the Liberty Stadium on Black Friday and when I say Joe’s Ice Cream nearly every branch in Wales including the factory workers turned up. The reason this was my favourite gig was down to the fact that the crowd was so energetic from beginning to end and it was the only gig last year were all the Diamond Dust Crew were together to provide the best service possible. I look forward to continuing working with Diamond Dust during 2018 and look forward to seeing you in a nearby gig. Tom Hyatt January Discos in Swansea and Neath. We have had some bookings in January including a children’s birthday party in Maesycwmmer Community Centre, two surprise birthday parties in Pontyates RFC and at Aberavon Green Stars RFC and finally a 60th birthday in New Dock Stars RFC in Llanelli. A lively Christmas Eve children’s party at Cwmavon RFC, near Port Talbot. 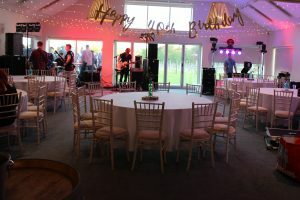 We also had a variety of birthday parties including two surprise ones; a 40th birthday at Celtic Lodge, Neath and 60th birthday at Coed Y Mwstwr Golf Club, Bridgend. The children’s birthday parties were a 4th at Arch Hall, Pontardawe and an 8th at Bryncoch RFC. We even had a wedding party at Maes Manor in Blackwood. We at DJ Diamond Dust would to take this opportunity to wish you all a Merry Christmas and a Happy New Year, Martin, Tom Ethan and Kelly. It’s been a mixed bag of gigs this month. 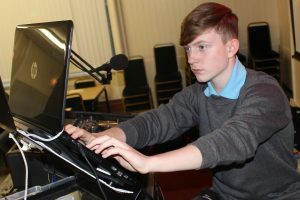 We have had two teenage discos, one in Cardiff Harlequins Rugby Club, and the other in the New Lodge Independent Club in Gorseinon, Near Swansea. 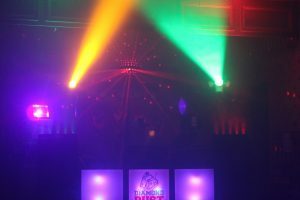 Both discos included UV lighting and a laser simulator. 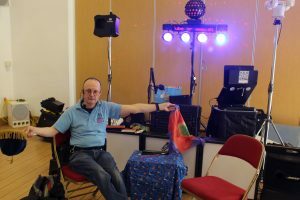 This time we had a shared 40th and 70th birthday party disco at Cwmllynfell Millennium Centre. 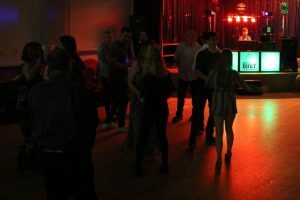 We were DJs at a 40th Birthday at Loughor Boating Club, and even a combined 60th birthday and joint retirement party at Mumbles Cricket Club. We had our first Christmas Party at Marriott’s Swansea, Christmas Party which also had an achievement awards for children in care. 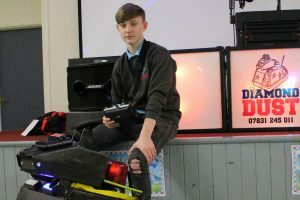 On the children’s entertainment side of our events, we attended a Village Christmas party at Longford Memorial Hall, which included Mascot the Robot and parachute games. Father Christmas visited and gave out presents to the children. We had a very successful 4th birthday party at Tonna RFC. The magic show was really enjoyed by the audience. There is a recommendation by one of our customers on our Facebook Children’s Entertainer Page. A big thank you! 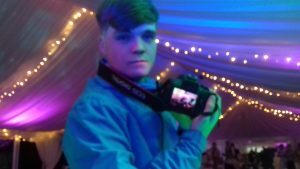 DJ Diamond Dust provided music and lights at an Engagement Party at Skewen RFC. Thank you again for your complements! “Myself and James just wanted to email you to say thank you so much for last night! 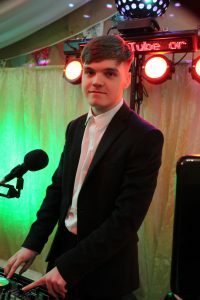 We thoroughly enjoyed ourselves last night and loved the music you played! Everyone said how much fun they had with the music! Least to say I enjoyed your music too! Thank you again and we will defo be using you again!” Lauren See us at Facebook Page: DJ Diamond Dust We are looking forward to a very busy month ahead! Thank you for your kind compliments, recommendations and support! The month of October has brought some very interesting gigs. 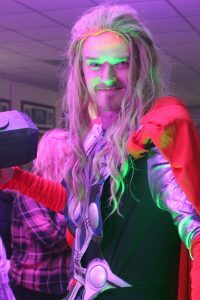 We’ve had a real mixture of gigs from Halloween Disco in Porthcawl to holiday park bookings! 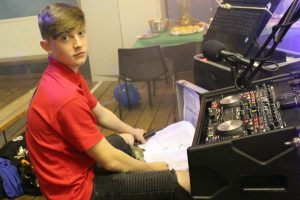 DJ Ethan Grey having some help with DJing! It’s nice to see our audience getting into the party spirit! We’re keeping the music going to keep the audience dancing and also running the requests. 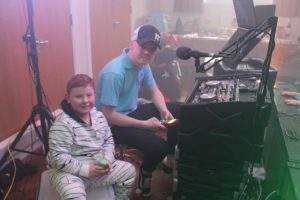 DJ Kelly Jack Roberts and Children’s Entertainer, Martin Thompson had a few children’s birthday parties. They had 10-year-old birthday party at Caehopkin Scout Hall, Abercrave, and a boy’s 10th birthday party in at Skewen Memorial Hall. Kelly and Martin did a combined 4th and 60th Birthday Party in at Dunvant Workingmen’s Club in Swansea. 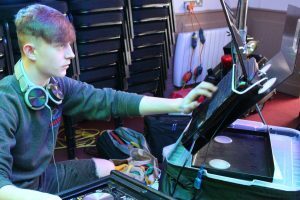 DJ Diamond Dust has had its share of other parties including 18th birthday parties at Bryncoch RFC, Neath and The Royal British Legion, in Burry Port. 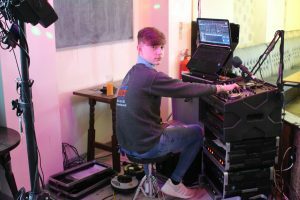 DJ Ethan Gray and DJ Martin Thompson have been DJs in Swansea at an engagement party at Fforestfach at The Embassy Social Club, Swansea and DJs in Whitland to celebrate the end of Summer Season in South Caravan Park in Tavernspite, Pembrokeshire. September had a mixture of bookings. 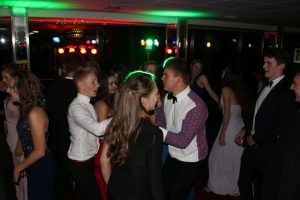 The Annual National Tetrathlon Ball at Chepstow was the highlight of this month at the Chepstow Racecourse. We don’t normally travel this far on a disco but it was well worth it. Great venue and lively audience. 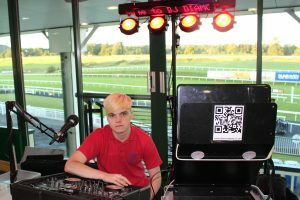 Ethan Gray – DJ Diamond Dust at Chepstow Racecourse. 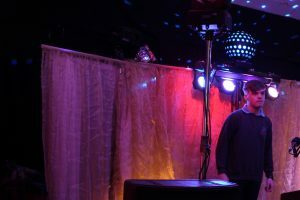 We did a birthday party at the Heronston Hotel, Bridgend, and a Wedding Disco at the Dockers Club in Swansea. 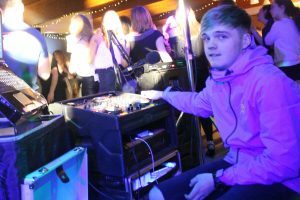 We ran a teenage disco for a 14th Birthday Party at Ystalfera RFC, Swansea. 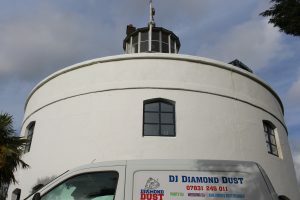 Diamond Dust has also attended a 40th birthday party at Trebanos RFC and a Wedding Disco at Burry Port RFC. DJ Diamond Dust in Tenby We had two visits to New Minerton Caravan Park in Tenby. One was an Annual Golf Presentation night, and the other was a return visit as Children’s Entertainers in the Tenby venue. 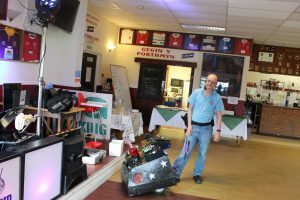 DJ Diamond Dust had a Team Building Function at the Ford’s Club in Swansea. 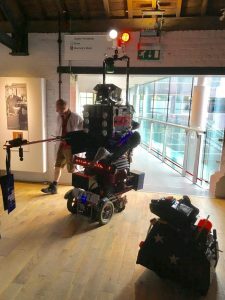 Our 8 Foot Robot Cat and Mascot the Robot Dog were in action on Sunday 10th September at the National Waterfront Museum in Swansea Science Festival (#SwanseaSciFest). 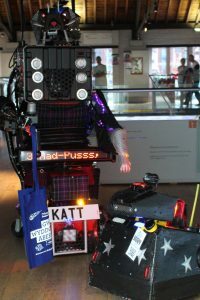 You can see more on our website: http://www.diamonddust.co.uk/8-foot-robot-cat/ Facebook Page: https://www.facebook.com/8FootRobotCat/ Our YouTube Channel DJ Diamond Dust: https://www.youtube.com/channel/UCIZmCx1pc63cyhq8YgjE4NQ. We would welcome any videos or photos taken on the day to add to our website!